Rollerland’s Attractions: Laser Maze, Playground, & Arcade! Rollerland’s laser maze is one of the most exhilarating challenges in the Fort Collins, Colorado area! As your child enters the room, the lights will dim and laser beams will pop up everywhere. She must make it through the maze without hitting the beams! Admission to the maze is $3.00/person for two runs or $5.00/person for four runs. For children 10 and under, Rollerland’s spacious playground is one of the best ways to get your kids active! They will spend hours weaving through our 2,000 square foot playground with friends. This is a super affordable activity that your kids will enjoy in the heat of summer or cool of winter. Our arcade is one of the best in the Fort Collins area! It has games such as Donkey Kong, Skee Ball, Air Hockey, Key Master, Pac Man, Crane Machine, and much more. Rollerland’s arcade is a place where kids and adults of all ages can have a great time. We want to make fun affordable. That’s why Rollerland is hosting a fun and games special for only $12.50! When you purchase our fun and games special, you receive unlimited skating, unlimited playground use (for children 10 and under), two runs in the laser maze, and 12 tokens for the arcade! 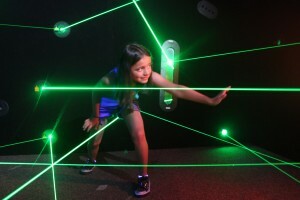 If your child doesn’t want to play in the playground, he can substitute the playground pass for two extra runs in the laser maze. This amazing deal is available during any public skating session. If you bring your kids on Tuesdays, Wednesdays, and Thursdays, you’ll only pay $9.50 for the fun and games special. (This special is also available on Fridays until 7 pm.) Do you have questions? Contact us today!